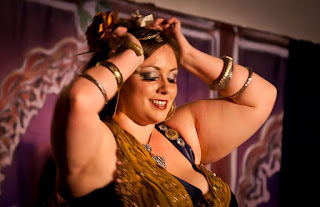 What's happening in March in the metro Atlanta belly dance community? Here are some of the highlights... check the Calendar page for even more! Friday 3/9: March is coming in like a lion with the Bellydance Superstars Club Bellydance tour, featuring some of the best local performers as well as the ladies we all love, including Moria and (recently announced) Petite Jamilla. I happen to know that Awalim is working on something that will knock your socks off! Saturday 3/10: Moria Chappell sticks around after Friday night's show for a Fusion Fundamentals workshop at Atlanta Fusion Belly Dance, presented by Awalim Dance Company. Sunday 3/18: Atlanta Fusion Belly Dance presents its semi-annual "AFBD's Got Talent" student showcase at Nicola's. Check out some of AFBD's established and upcoming stars, and enjoy the fabulous food and hospitality you can only get from Nicola! March 25/26: Nazeem Allayl Studios' Spring Student Show at the Perimeter Studio. Over 60 dancers performing cabaret, folkloric, and fusion group performances and solos! Saturday, March 31: Don't miss the first event produced by Mina of Dalloua Dance Company since she arrived on the scene, "Midnight at the Oasis" at Kavarna in Oakhurst. Get out there and support your sisters! From the Shameless Plug Dept.